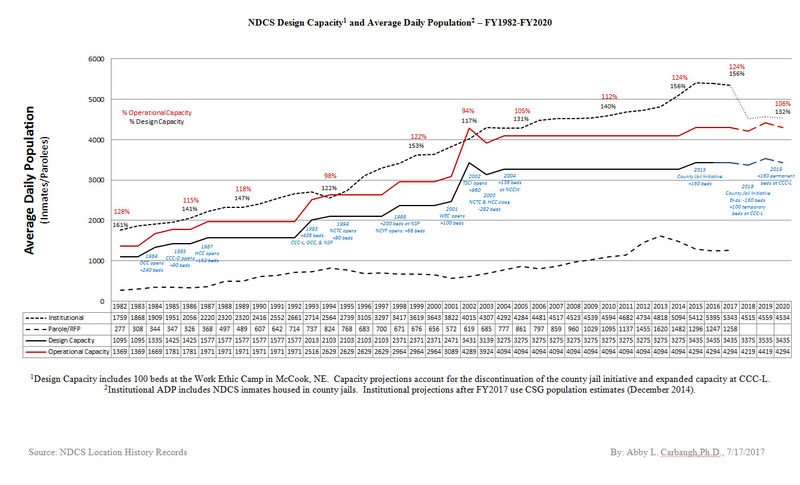 The graphic to the right shows the actual and projected changes in the design and operational capacities of the 10 NDCS facilities, as well as the average daily population (ADP) of the Department, between Fiscal Years 1982 and 2020. At the end of FY2017, NDCS had an ADP of approximately 5,343 inmates. While this seems like only a slight decrease from the FY2016 ADP of 5,395, it has a significant effect on the overall operations of NDCS. Specifically, a average reduction in population of 52 people per day translates into 18,980 bed days, or days in which a person was no occupying a prison bed. This 1% reduction in population resulted in significant cost-savings for the Department.